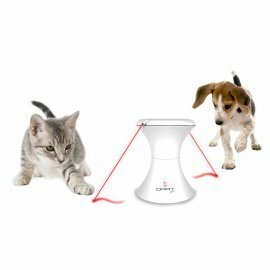 DART DUO is an automatic rotating light with two lasers for shared play with multiple cats and dogs. Place the toy on the floor, turn it on, and watch them play! Two lasers move in a circle, darting and switching directions in random patterns. 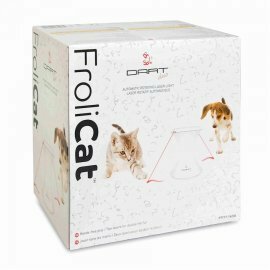 The unpredictable movement entices your pets to dart, pounce, and chase the red dot. Each laser spins in a circle on opposite sides so pets aren’t competing for the same laser. 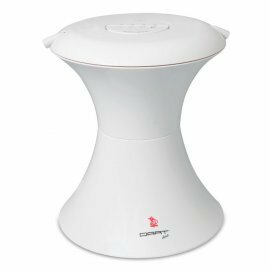 4 adjustable speed and 4 timer settings create 16 engaging play combinations. Set DART DUO on a level floor. Press ON/OFF • SPEEDS button to turn on. DART DUO will run for 5 minutes on slow speed. Press ON/OFF • SPEEDS button on top of DART DUO a 5th time to turn it off. 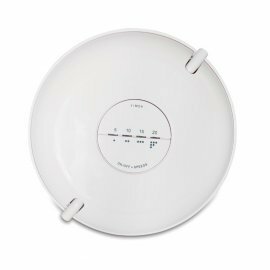 DART DUO will automatically turn off after 5 minutes, but can be set for 10, 15, or 20 minute time periods.